I recently had a video sent to me by one of our NY/NJ area network providers, Rob Kramberg, M.D. This was sent to him by a grateful patient who was so concerned by repeat patellofemoral syndrome surgery recovery, she skipped the revision surgery and had her own stem cells injected instead. I loved the video so much, I thought I’d post it! The patient is a 35 yo woman with a 15 year history of bilateral knee pain. She originally injured her knees skiing at age 17. In October 2012 she underwent bilateral arthroscopic lateral release surgery then 5 months of post-op PT-she still had pain. A lateral release is a tough surgery where the fascia and ligaments around the outside of knee cap are surgically cut to try and better align the knee cap in it’s grove. The problem with lateral release surgery is that in our experience, it rarely works. We have seen many patients through the years who are very dissatisfied with the results of their surgery and who are still in as much pain, or have more pain. The patient also had one set of Synvisc injections with moderate relief. When she was initially seen by Dr. Kramberg she had difficulty walking up and down stairs and with prolonged walking. An MRI or her right knee in December of last year revealed articular cartilage loss on the under surface of the lateral patella, joint effusion (swelling) with synovitis, and chondromalacia (bad cartilage) of both medial and lateral knee compartments. She had the Regenexx-SD stem cell procedure completed on 2/11/14. 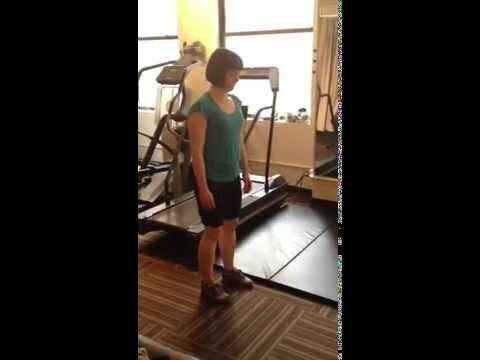 The video above shows her progress at 3 months after the stem cell injection. She is in the process of scheduling to have her left knee injected in August. The upshot? Patellofemoral surgery recovery can be a tough road, as this patient found out. Why not skip the surgery and opt for an injection of your own stem cells under precise imaging guidance under the knee cap? The proof seems to be in the jumping woman above!